“Love at first sight” – it lies at the core of classic fairy tales, but recent research into animal mating habits shows that this phenomenon is likely just a fantasy. Scientists at the University of Tokyo have published research that shows that the mating habits of fish are heavily influenced by their familiarity with those around them. In other words, fish are more likely to mate with a familiar individual than with a stranger. This research is shedding new light onto the factors that influence social decision-making. 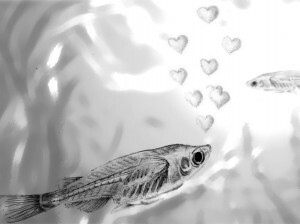 Investigating the neural basis of this decision-making allows us to extend applications of these aquatic experiments to humans as well; through animal studies, scientists are learning why humans fall in love. The University of Tokyo study, published in early January, sprung from a desire to investigate the relationship between neural activity and social decisions, especially in the realm of familiarization. Social familiarization, or becoming familiar with another individual through sensory contact, is a common phenomenon in nature that scientists have observed in many animals. Previous studies investigating mating preference in guppies and voles have demonstrated that familiarity generally increases mating preference. Among humans, familiarity and mating preference are certainly linked, even though attraction as a whole is a complex psychological and biological process. Still, research on love and attraction has suggested that humans are more likely to fall in love with those they spend the most time with. A 2011 study conducted at the University of Rochester examined social familiarization in humans. The experiment analyzed how the amount of interaction between two people affected their mutual attraction. Results showed a positive correlation between these two variables, and the University of Tokyo experiment has yielded similar data from studies on fish. The Tokyo lab chose to focus on medaka, colloquially known as rice fish. This species was a suitable target for study because of its well-understood sequential mating behavior. Mating in medaka occurs in two steps: the male performs a courtship ritual, and then the female either accepts or rejects him. This female’s decision-making step was essential to the research, which investigates how social familiarity influences how the female receives the male’s courtship. The study consisted of various experimental groups. In some groups, fish were familiarized with each other through transparent walls. Meanwhile, in other groups, fish were kept apart. To collect data, researchers combined male and female fish in a tank and timed how long it took for a female to mate after the initial male courtship display. The results of this study showed that the receptivity of the female medaka was affected by how familiar she found her potential mate. Groups in which the female was familiarized with her mate displayed lower latency periods; when there was a lack of familiarity between fish, latency periods were longer. In order to better understand the neural mechanisms behind these observations, the researchers next delved into the medaka’s DNA. Two mating mutants drew their attention. These genetically-altered females displayed increased receptivity toward males regardless of familiarity. Further genetic investigation revealed that the cause for irregular behavior in both these mutants may lie in the TN-GnRH3 neuron, which is closely associated with reproduction. Researchers concluded that a protein normally found in this neuron may suppress female receptivity, which explains why fish with a mutant, altered protein are just as receptive to courtship from strangers as they are to courtship from familiar males. Researchers around the world are now interested in the TN-GnRH3 neuron and its role in social decision-making in all vertebrates. These studies in the aquatic realm could uncover new information relevant to human mating patterns, as TN-GnRH3 neurons also function in mammals. Our own mating habits are still mysterious. Why are we attracted to people? Is it just chance, or will we one day understand and be able to control these instinctual emotions? TN-GnRH3 could be key in answering these questions. Linking TN-GnRH3 to recognition-based mating preference will also allow scientists to explore how this neuron type relates to recognizing kin, bonding with a mate, and other aspects of social neuroscience. This field, located at the intersection of biology and society, could provide us with the tools needed to better understand the love-related mysteries within our minds.